2017: A busy year for our Time keepers. Like other years, we take some time to review the year that has passed so quickly. 2017 has been another successful year for us in Europe and Asia, but also for our clients using RSTime. Together with Time Service Asia we have done more events than the previous years. Two big series were of course the 24 hours series by Creventic and the Asian Le Mans series by the ACO. the Historic GP at Zandvoort, the 24 hours of Zolder, the American Festival at Zolder, etc. And we had a lot of local series and events..... too much for a full list. Making event results available for everyone. All Results are available as PDF online and for download. You want to know how you, your competitor or your favorite driver performed on the track today? RaceResults will give you all the information you need with our live-timing during the race and race results after the finish. RaceResults is an initiative of TimeService.nl and shows the results of events timed with RSTime timing software. We have build an online database with event results from 2004 until now. Among the results are all kinds of motor- and autosport events timed at different circuits, for example; 24H races of Zolder and Dubai, ONK and KNMV Cup races at TT circuit Assen, Sidecar festival at Motorsportarena Oschersleben, Karting events and many more. At the results page the timing information of every heat can be found shortly after the Qualification or Race is finished. Depending on the circuits timing points and the type of race, sector times, pit and stint times, laptimes, startgrids, and more will be available. Our newest addition to the RaceResults website are the Live timing and Race Tracker. This application is the best way to follow the race. If you have a modern laptop, tablet or smartphone you can watch the live timing and tracker. Both the live timing and tracker are realtime, without delays. 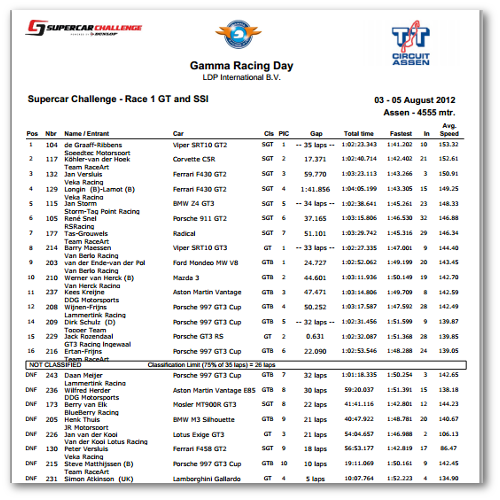 The live timing shows the realtime race positions, laptimes, gaps, diff, sector times and more. 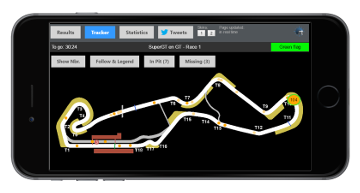 The Tracker tracks the position of the cars that are driving on the track. Copyright 2019 by Time Service B.V.